Explan. Diagr. Austroechinocactinae 131 (1957). Origin and Habitat: Salta and Jujuy, Argentina. Walter Rausch collected this plant in the Quebrada de Humahuaca in Jujuy (R214) and also in Salta and Catamarca (R751 and R823). Lau recollected it in Volcán between 3200 and 3300 m above sea level (L520) and Mats Winberg collected the var. tilcarensis in Tilcaras between 3100 and 3200m above sea level (MN163). Altitude range: 3200-4000 metres above sea level. Habitat and ecology: This cactus occurs on dry rocky outcrops in puna together with Lobivia sublimiflora, Rebutia pseudodeminuta, Lobivia jajoiana. 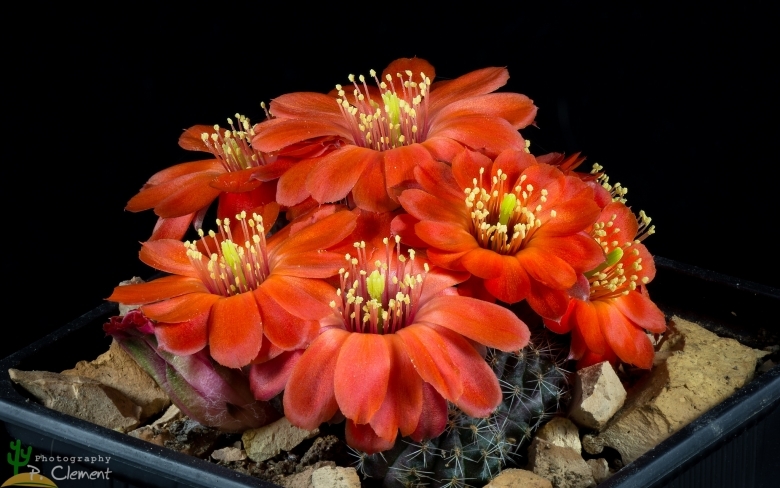 Description: Rebutia euanthema is a popular species with very showy orange-red flowers, with small stems freely offsetting from the base forming clumps 70-80 mm in diameter. The spines are always slightly erect never appressed. Rebutia euanthema is one of the morphological or local forms of Rebutia einsteinii subs. aureiflora, and the two plants are not readily distinguishable, if not for the geographical provenance. More likely they are one and the same species. Also, you can include Rebutia euanthema as a synonym of Rebutia einsteinii subs. gonjianii, as at the top of the Quebrada de Purmamarca the red-flowered R. euanthema gradually merges into the yellow-flowered R. einsteinii subs. gonjianii. Stem: Up to 30 mm in diameter (often more in cultivation), grey-green often tinged amethyst. Areoles: Elliptical, light brownish in colour. Radial spines: About 10, often pectinate, always slightly erect never appressed, up to 10mm long, white tipped brown. Flowers: About 45 mm long and 30mm wide with orange-red petals. Flower tube very hairy with occasional bristles. Stigma and style greenish-yellow, 6-lobed, filaments lavender pink. Fruit: Brownish-red, densely covered with white hairs. Rebutia aureiflora var. albiseta (Backeb.) Borg: has 10 mm long white spines. Rebutia aureiflora var. albi-longiseta (Backeb.) W.T.Marshall: has long pure white bristles. Rebutia aureiflora f. boedekeriana (Backeb.) Šída: has has 11-12 thin radial spines and pale orange flowers. Rebutia aureiflora f. rubelliflora (Backeb.) Buining & Donald: has orange-red flowers. Rebutia aureiflora f. rubriflora (Backeb.) Buining & Donald: has red flowers. Distribution: Salta, Argentina. Rebutia einsteinii subs. aureiflora (Backeb.) Hjertson: Has large mostly yellow or orange flowers with white throat. It is very variable. Distribution: North-west Argentina near to the Salta – Jujuy border around Quebrada del Toro. Rebutia einsteinii subs. gonjianii (R.Kiesling) Hjertson: has minuscule, thin finger-like stems branching from the base or higher in the manner of a miniature saguaro, from a thick, fleshy taproot. Spines pectinated less than 1 mm long. Distribution: Huacalera, Tilcara (Jujuy, Argentina). Rebutia einsteinii subs. gonjianii f. cristata hort. : Crested form. 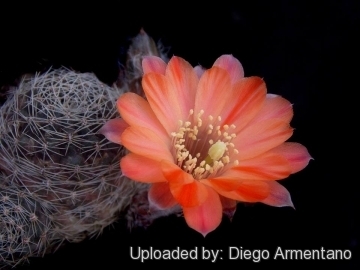 Rebutia oculata Werderm. : has deep lateral incisions between areoles, few (6-8) radial spines less than 12 mm long and crimson flowers 4,5 cm long, 5 cm wide. Stigma pale green. Distribution: Challapata, Bolivia. Cultivation and Propagation: Rebutia euanthema is a summer grower species that is easy to cultivate. Soils: It likes very porous standard cactus mix soil. Prefer a neutral or low pH compost, avoid substrata rich in limestone. Repotting: It is better that they are repotted regularly. Repotting will increase the number and size of stems and will increase the number of flowers produced. Repot yearly until reaching about 100mm in size, then every two or three years will suffice. Repotting is best done at the end of winter but can be done at other times. Do not water for a couple of weeks after repotting to reduce risk of root rot via broken roots. Use pot with good drainage. Watering: Needs moderate to copious waterings in summer, but do not overwater (Rot prone), keep dry in winter at a minimum temperature of 0°C. Hardiness: Reputedly resistant to frost if kept on the dry side prior to, and during, cold weather (hardy to -4 C ° C, or less for short periods). Exposition: The plant tolerates bright situations but enjoys filtered sunlight or afternoon shade, inside it needs bright light, and some direct sun. Tends to bronze in strong light, which encourages flowering and heavy spine production, but is likely to suffer from sun scorch or stunted growth if over exposed to direct sunlight during the hottest part of the day in summer. - Rot: This species is particularly easy and accommodating, seldom suffer of cryptogamic diseases. Rot it is only a minor problem with rebutias if the plants are watered and “aired” correctly. If they are not, fungicides won't help all that much. Propagation: Division, direct sow after last frost. Seeds germinate in 7-14 days at 21-27° C in spring, remove gradually the glass cover as soon the plants will be well rooted (ca 1-2 weeks) and keep ventilated, no full sun for young plants! Seed Collecting: Permit fruit to ripen. Fruit must be significantly overripe before harvesting seed; clean and dry seeds. To make a cutting twist off a branch and permit it to dry out a couple of weeks, lay it on the soil and insert the stem end partially into the soil. Try to keep the cutting somewhat upright so that the roots are able to grow downward.